This Easter the message of the ruin of the Kingdom of Christ seems to be the theme of choice in so much of the media. The tragic murder of a little Sandra Cantu in Tracy California has been pinned on a neighbor woman. While the motive remains a mystery the media seems intent on publicizing at every opportunity the fact that the accused was a Sunday School teacher in a neighboring Baptist Church. The chorus of anti-religion seen in the comments online of various media is virulent in the hate and disdain of things of God. President Obama has appointed Harry Knox to the Faith-Based Partnership Council. Interestingly Harry Knox seems to thrive on criticizing Roman Catholics and other traditional Christians. It is applauded by those who seem to want to affirm the President’s comments on his European trip that the United States was not a Christian country. Even in the natural world the earthquake in Italy has wrought heartbreaking sorrows on that country. The images of beautiful old churches in broken ruin, of masses of caskets, some of little children, to some, would speak of absence or perhaps the judgment of God. Yes. There is real sorrow and shocking violence abundant in life. 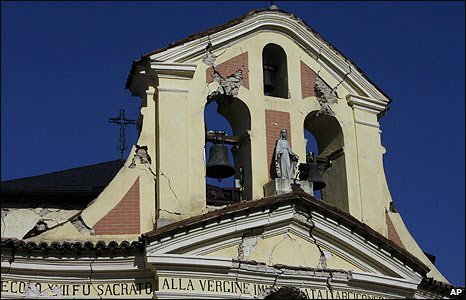 The focus of those who would look for and find every fault and crack in the church as a sign of ruin is very prevalent. But none of this is new. Evil, sorrow, bigotry and hate have been a part of life on earth for a long time. The Church, the Body of Christ has been assaulted in many ways, times and places. Many years ago a young Catholic man, after experiencing the empty violence and greed of the world found himself in a ruined little church. It was there Christ spoke to Francis of Assisi to rebuild His Church. Even centuries earlier at a tear and fear drenched tomb some women came to tend their very real grief and sorrows. Another earthquake shattered their world. 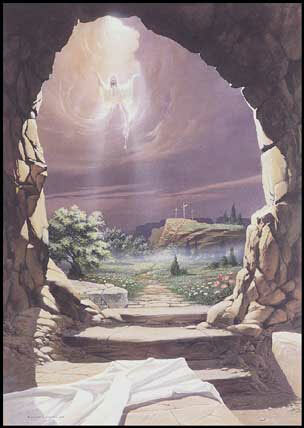 The angels appeared and proclaimed: “He is Risen. Go and tell the others”. Easter ~ 2009 amidst the sorrows and doubts of this world our Risen Lord, His holy love will still triumph. Peace and all good in the Peace of the Risen Christ.